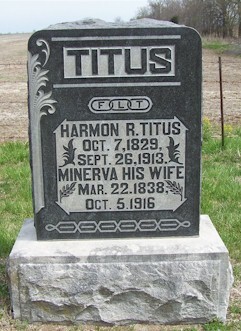 Harmon Titus was a native of Muskingum County, Ohio, born October 7, 1829 to Mr. and Mrs. Samuel Titus. By the 1860 census, Harmon had married Minerva Nelson, a native of Indiana. They were living in Tippecanoe County Indiana with their 2 year old daughter, Josephine. 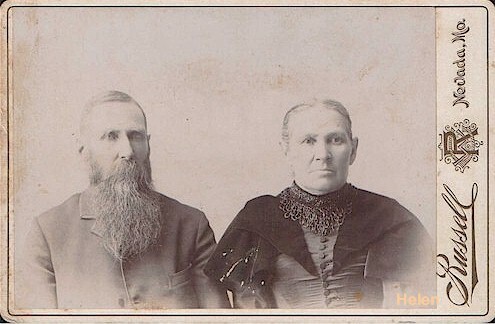 In 1870, they had moved west and were living in Crawford County, Kansas. Their children were Josephine, age 10; Samuel, age 7; Martha M., age 6; and Orin (Oren), age 5. All of the children had been born in Indiana. Helen Landis shared this photo of Harmon and Minerva Titus. The 1900 census showed Harmon and Minerva living in Harrison Township, Vernon County, MO. It told that they had had six children and five survived. Living next door to his parents in the 1900 census was Homer W. Titus (born September 1876), his wife, Adelia Titus (born July 1879) and their son Alva, born December 1897. Helen wrote: I don't remember exactly when Harmon and Minerva came to SW of Bronaugh, but know it was after Grandad was born in 1876. Harmon Titus helped build the first McKill Chapel. Harmon and Minerva worked hard in the Church. Son Homer's obituary tells that he was brought to Vernon County at age 5, showing that the Titus family must have arrived in Missouri about 1881. The 1910 census showed Harmon and Minerva living on Oxford Road in Harrison Township. Living on the same road nearby were sons Oren, Homer, and Samuel with their families. McKill Chapel Cemetery records list Harmon R. Titus, October 7, 1829 - September 26, 1913 and Minerva Titus, March 22, 1838 - October 5, 1916. Harmon's death certificate confirms his birth date and lists his father as Samuel Titus. Helen wrote:. Harmon's children that are at McKill Chapel: Samuel J. His first wife and he had the two infants and Clyde . Then he later married Florence Mullies with which he is buried. Marta Matta Titus Chapman and husband James Henry Chapman. Oren Titus and 1st wife had Lawrence Titus. They divorced and he married Emma Maxwell with whom he is buried. Homer and Ardelia (Delia Steinbach) Titus married March 30, 1897. They had been married 57 years when Delia passed away in 1954. To this union there were three children, Alva, Alda,and Arline. Delia belonged to the Methodist Church in Bronaugh, as did her Mother when the Steinbachs lived in the Bronaugh area. Delia always enjoyed the quilting days they had there and was always considered a good cook. 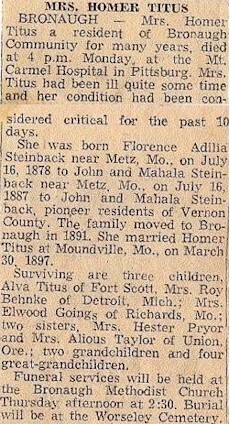 She was the daughter of John Steinbach and Mahala Wray Steinbach and was born in the Metz area. Homer was born in Wilson Co., Kansas and moved to SW of Bronaugh at the age of 5. He was the son of Harmon and Minerva Nelson Titus. 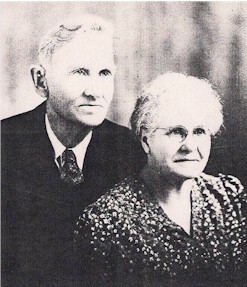 Homer and Delia llived southwest of Bronaugh most of their lives. They are both buried at Worsley cemetery. Left: The obituaries for Homer and Delia Titus. Homer Titus was born September 30, 1876 and died November 20, 1963. Thanks to Helen for sharing these obits. If you have Titus information to share or questions please email Helen.